Apparently NBC’s struggling Chicago Fire is even more realistic than many give the show credit for. 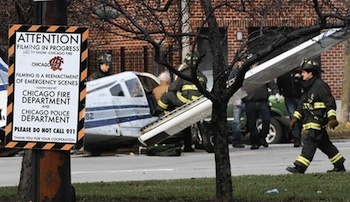 Early yesterday morning, Deadline reports that Chicago’s WGN urgently reported a plane crash in the middle of a local road. Apparently, it was actually just a scene being filmed for Chicago Fire. Though the area was littered with signs indicating that filming was in progress, local anchors couldn’t see them and believed the accident was real. More about: Chicago Fire, Chicago Fire: canceled or renewed? This just in! Media so desperate to be first to get “the ratings” that fact checking and confirmation have gone out the window. Later we have weather, sports and ongoing coverage of the unicorn spotted at the zoo, the alien landing and an honest politican. WZZZ, first with news!